High Tech Early College scholars are provided an opportunity to enroll in concurrent enrollment coursework through Aurora Community College. This program allows students to earn college credits while fulfilling high school graduation requirements. Students will take the Accuplacer twice a year in order to assess college readiness skills and eligibility for college coursework. Qualifying students can begin to earn college credits with tuition covered by Denver Public Schools. This can result in significant savings of time and money for High Tech scholars. Students may earn up to two years of college credit upon graduating! Visit Concurrent Enrollment at the Community College of Aurora for more information. Students who have completed all concurrent enrollment classes on our campus may select courses at CCA. 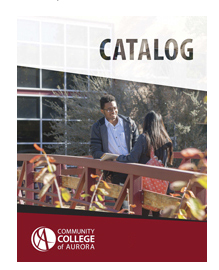 Students can use the catalog below as a guide for anticipated course offerings at CCA. Examines theories and practices associated with successful learning to enhance college success. Areas of study include education and career planning, effective communication, personal management, critical and creative thinking, development of community and awareness of diversity, leadership, and techniques for successful academic performance. Recommended for new and returning students. Studies communication theory and application. Topics include communication models, interpersonal communication and the concept of self, nonverbal communication, message preparation and analysis, and decision making. Explores the role of contemporary media in shaping our sense of ourselves and our world. The class surveys a broad array of critical approaches to understanding media. Emphasizes the planning, writing, and revising of compositions, including the development of critical and logical thinking skills. This course includes a minimum of five compositions that stress analytical, evaluative, and persuasive/argumentative writing. Expands and refines the objectives of English Composition I. Emphasizes critical and logical thinking and reading, problem definition, research strategies, and writing analytical, evaluative, and/or persuasive papers that incorporate research. Basic word processing skills needed. Introduces students to fiction, poetry, and drama. Emphasizes active and responsive reading. Multi-disciplinary survey of contemporary and historical research analyses of the diverse social, economic, political, and cultural facets of African American, American Indian, Asian American, and Latino communities and cultures. Surveys the history of African Americans. Study interpretations, and analysis of major problems, issues, and trends affecting the African American population from pre-slavery to the present. Covers the creation and production of graphic projects, emphasizing the layout creative design process, problem solving, and research. Provides experience producing thumbnails, roughs, and digital layouts emphasizing refined creative typography. Concentrates on the high-end capabilities of Adobe Illustrator as an illustration, design and vector drawing tool. Students learn how to use the tools to create digital artwork that can be used in web design, print media, and digital screen design. Course competencies and outline follow those set by the Adobe certified Associate exam in Visual Communication using Adobe Illustrator. Develops algebraic skills necessary for manipulating algebraic expressions and solving algebraic equations. Topics in the course include radicals, complex numbers, polynomials, factoring, rational expressions, quadratic equations, absolute value equations and inequalities, systems of linear equations, related applications, and math learning strategies. This course prepares students for College Algebra and Finite Math. Includes a brief review of intermediate algebra, equations, and inequalities, functions and their graphs, exponential and logarithmic functions, linear and non-linear systems, selection of topics from among graphing of the conic sections, introduction to sequences and series, permutations and combinations, the binomial theorem, and theory of equations. A graphing calculator is required. Topics include trigonometric functions (with graphs and inverse functions), identities and equations, solutions of triangles, complex numbers, and other topics as time permits. This is a traditional prerequisite course to the calculus sequence. Graphing calculator required. Introduces single variable calculus and analytic geometry. Includes limits, continuity, derivatives, and applications of derivatives as well as indefinite integrals and some applications. Graphing calculator required. Examines the basis of biology in the modern world and surveys the current knowledge and conceptual and framework of the discipline. Explores biology as a science – a process of gaining new knowledge – as in the impact of biological science on society. Includes laboratory experiences. Designed for non-science majors.